The definitive work for IT professionals responsible for the management of the design, configuration, deployment, and maintenance of enterprise wide security projects. Provides specialized coverage of key project areas including Penetration Testing, Intrusion Detection and Prevention Systems, and Access Control Systems. 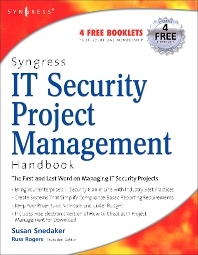 The first and last word on managing IT security projects, this book provides the level of detail and content expertise required to competently handle highly complex security deployments. In most enterprises, be they corporate or governmental, these are generally the highest priority projects and the security of the entire business may depend on their success. IT professionals responsible for the management of the design, configuration, deployment, and maintenance of enterprise wide security projects.